While 12-time Gold Glove winner (1957-’68) Willie Mays’ most famous defensive play – nicknamed “The Catch” by baseball enthusiasts - occurred during Game 1 of the 1954 World Series fans of the San Francisco Giants - and later New York Mets - fans were treated to The “Say Hey” Kid’s defensive gems on a regular basis. According to Willie Mays’ first big league manager Leo Durocher, “Willie did the five things you have to do to be a superstar: hit, hit with power, run, throw, and field. And he had that other ingredient that turns a superstar into a super superstar. He lit up the room when he came in. He was a joy to be around." Although the newest member of the Chicago White Sox, Ken Griffey, Jr. (acquired from Cincinnati on July 31st) is blessed with one of the most naturally beautiful and potent batting swings in MLB history; his defense play for the Seattle Mariners and Reds during the 90’s was widely considered as the standard of excellence for major league outfielders. Thanks to his impressive range of spectacular diving plays, over-the-shoulder basket catches and leaping grabs that robbed opposing hitters of homers at the wall, Griffey won 10 consecutive Gold Glove awards from 1990-99. "My dad (Ken Griffey) taught me that there's three parts: There's hitting, there's defense, and there's base running. And as long as you keep those three separated, you're going to be a good player. I mean, you can't take your defense on the bases, you can't take your hitting to the field, and you can't take your base running at the plate. But defense, is number one." - Ken Griffey, Jr.
"I'd rather have a Gold Glove (Award) than a Silver Slugger (Award), said Alex Rodriguez, who achieved his goal two straight years with The Texas Rangers (2002-03). “Defense is so much more of a team game and one of my goals this year was to make fewer than twenty-five errors." While “Iron Mike” Schmidt created an offensive legacy that may never be equaled during his 18-year career with the Philadelphia Phillies, he was equally proud of his crowd-pleasing defensive play at the Hot Corner, which led to his being awarded a National League record 10 Gold Gloves (1976-84, 1986). When he retired in 1989, he held 10 NL fielding records and ranked third all-time at third base with games played (2,212), assists and assists per game; and fourth best ever with double plays turned. An advocate of all-out effort during and after his playing days, Schmidt always maintained that a player’s attitude will determine his success in baseball. “If you could equate the amount of time and effort put in mentally and physically into succeeding on the baseball field and measured it by the dirt on your uniform, mine would have been black,” he said. Besides hitting for phenomenal power and average, Hammerin’ Hank Aaron could also run, field and throw with anyone. In fact, he earned three consecutive Gold Glove awards (1958-60) by doing what he did best, day in and day out, year after year for the Milwaukee/Atlanta Braves. And he did it in relative anonymity created by his own soft-spokeness and deceivingly smooth style of play, as well as the fate of spending his career in Milwaukee and Atlanta, well off the beaten path of the media swarm. In addition to coming to the “Friendly Confines” to watch players like Ernie Banks and Ron Santo bat, Wrigley Field faithful also loved it when Mr. Cub helped turn one of the Cubs’ patented double plays. Athletic and rangy, he was an early prototype of the sort of shortstop the major leagues have seen over the past three decades, such as: Cal Ripken and Derek Jeter. In the field, while his range factors were above average, so were his error counts -- but he worked hard to improve this, and by 1959, he made only twelve errors in 519 total chances, while still having a superior range factor of 5.13. From his debut, he played in 424 consecutive games. 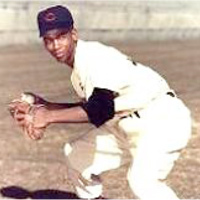 After he returned from the hand injury, Banks began another consecutive-game streak, which ran for 717 straight games starting on August 26, 1956, and ending on June 23, 1961. During that stretch, the MLB recognized his stellar fielding skills by honoring him with a 1960 Gold Glove. While Barry Bonds’ offensive legacy will continue to be debated for years to come, he challenges baseball fans and pundits to consider his all-around effort as a base-runner and defensive player, when judging his MLB career. "I never stop(ped) looking for things to try and make myself better," said Bonds of his defensive abilities and efforts that earned him eight Gold Gloves (1990-94, 1996-98). "Steady Eddie" Murray won three consecutive Gold Gloves (1982-84) for the Baltimore Orioles and is considered by many to be one of the best defensive first basemen in O’s history. Consistency, durability and dominance characterized the career of Eddie Murray. Although close friends maintain that Murray was a kind and caring person, he carefully maintained a harsh public persona, which led fellow Oriole and Hall of Famer Jim Palmer to nickname Murray “Darth Vader” because he always showed the world his “angry mask” in public and games. According to Orioles staffer Carl Steinberg, "In 1985, it was my job to put the big picture of him up on the Diamond Vision board. I put a warm, friendly, smiling picture of him up there. I wanted everyone to know the man I knew," Steinberg said. "Eddie comes into the office and says, 'Charlie, you've got to change that and make it look meaner.' I told him I thought it was nice. He said, 'Nice? I want that pitcher to look at me up at the plate and I have a scowl. And when he turns around to center field for relief, he'll see a picture just as mean. That way he'll know: There's no way out.' With Eddie, it was always about winning," Steinberg said. Although Mickey Mantle was credited with only one Gold Glove (1962), his speed in the outfield and around the base path was legendary. Unfortunately, so was the agonizing pain he played through. "Hitting the ball was easy. 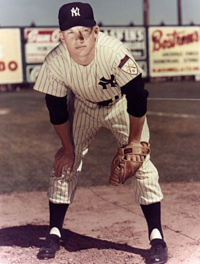 Running around the bases was the tough part,” Mantle was quoted as saying. Back with the Texas Rangers after five years in Baltimore, Palmeiro posted his highest slugging percentage (.630) and OBP (.420) in 1999. His 47 homers and 148 RBI helped power Texas to the playoffs. Somehow the DH won the Gold Glove Award, despite playing just 28 games at first base. He was primarily a DH, but voters ignored that fact. Another interesting choice for Gold winners in the 1990’s was Mark McGwire during his days with the Oakland Athletics…before he got the nickname Big Mac.